For roughly a year now, Topps has been issuing 5″ x 7″ sets (usually serial-numbered to 99) to coincide with each of their Wall Art releases. 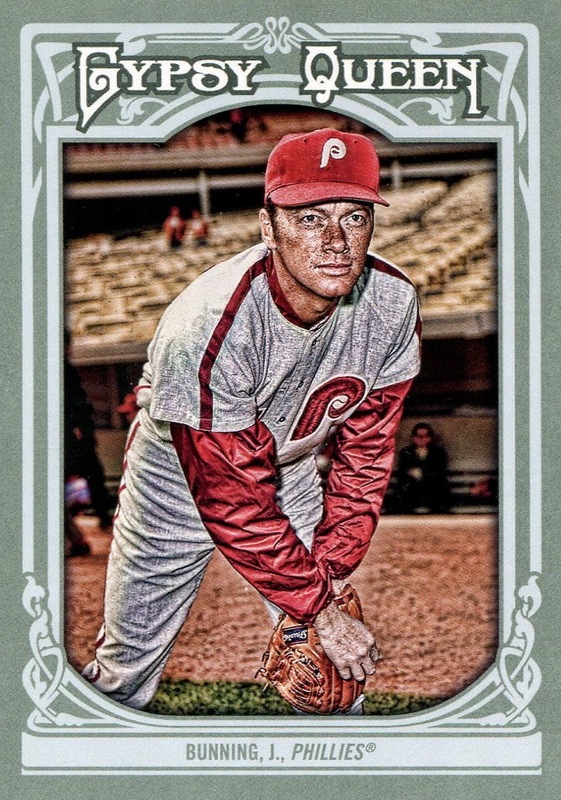 Ever since they came out with the 60th Anniversary Team Sets, I’ve been trying to keep up with them and add each to the Phillies Database as Topps adds them to its website. However, Topps also removes them from the website as soon as they sell out, and though I try to check the site regularly, I’m certain that I’ve missed a few over the past year. Unfortunately, Beckett has done a rather poor job of documenting them in its online checklists. So, if I didn’t see it on Topps’s site, then chances are pretty good that I don’t have the card listed (I have caught a few on eBay, after the fact.) As for acquiring the cards themselves, thankfully, there are dealers who are buying the 5″ x 7″ sets and breaking them up for team and player collectors. Otherwise, I know I would own rather few of the Phillies from these sets as I don’t have the money, time, or patience to buy each offering and then attempt to sell all the unwanted singles on eBay. For those of you who are interested, Topps just issued another series of online exclusive team set that is very reminiscent of last year’s 60th Anniversary offering. The ’52 Tribute Team Sets are $19.99 and though the print run is still 99, they increased the set size to nine cards from five. 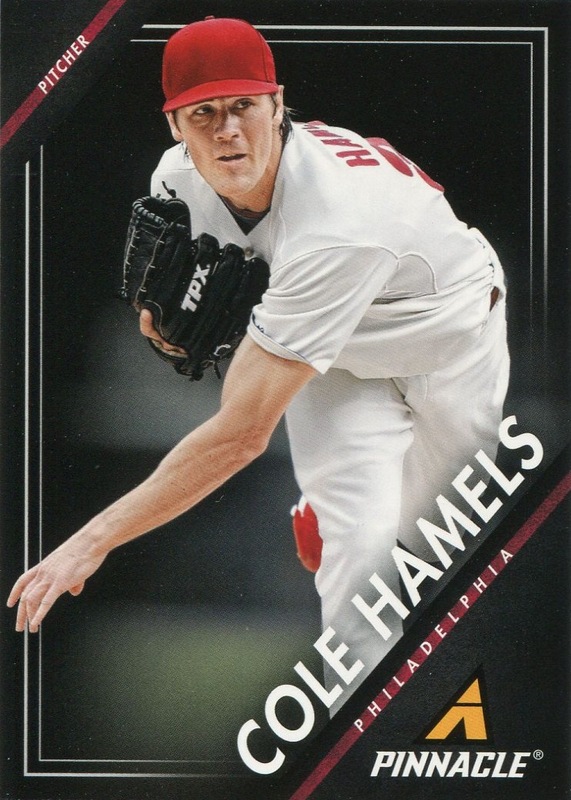 Proving that Topps just can’t help themselves when it comes to parallel creep, they’ve also issued a Gold version that’s serial-numbered to just 49 and costs an extra $10. 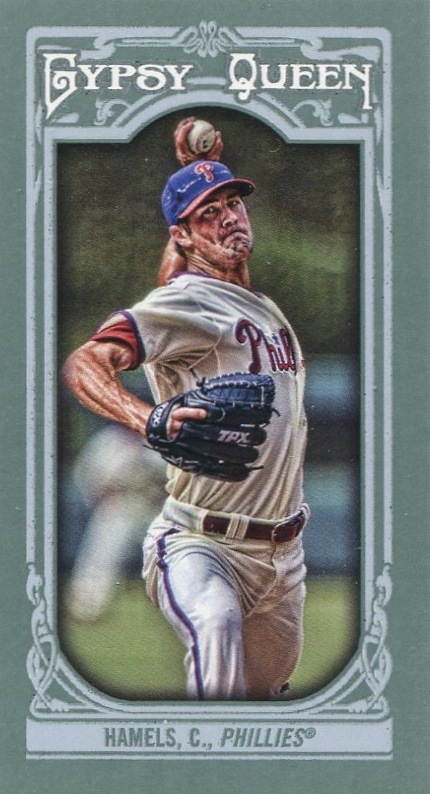 However, they did at least have the decency to include an extra card, Schmidt, in the Gold version. Because of the nature of my obsessive-compulsive disorder regarding my collection, I splurged and purchased the Gold, but I wasn’t very happy about it. Quite frankly, I didn’t see why Topps had to resort to the extra card gimmickry — the Gold version already differs in that the background for each player is yellow/gold, rather than green, blue or red as is the case with the regular set (which doesn’t use yellow/gold at all.) 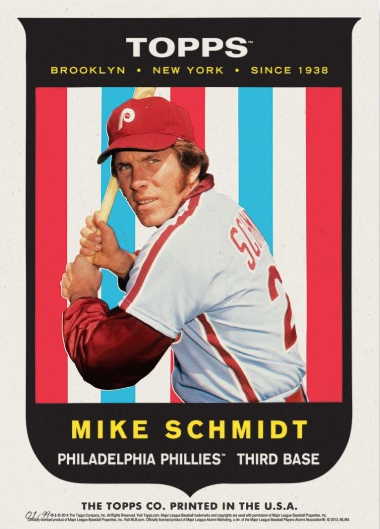 Both sets should have had the Schmidt card. Since I just submitted my order a couple days ago, I haven’t received my set yet. 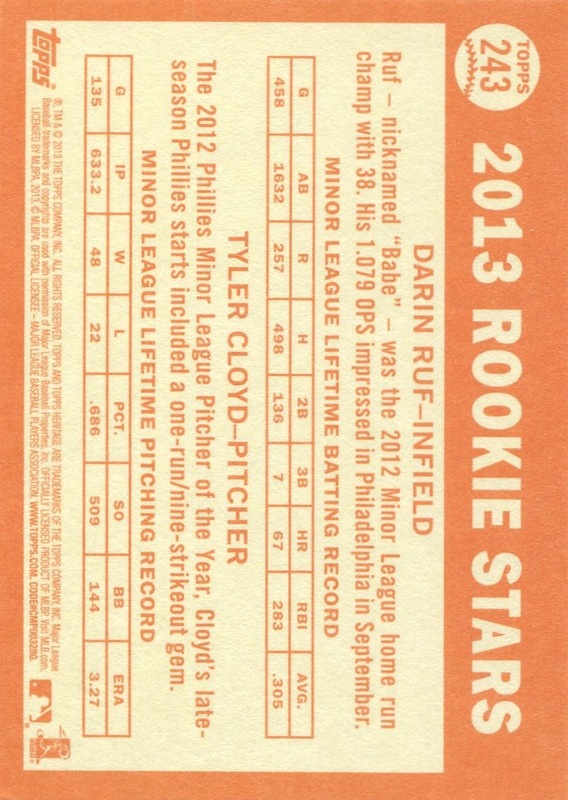 However, looking at the scans of the cards on Topps’s website, I’m already seeing lots of things to nitpick about. I’d list them, but honestly, what’s the point? Topps doesn’t clearly doesn’t care about the small details the way I do. Nonetheless, I am still looking forward to the set for no other reason than I get to update the 1952 Topps design virtual pages I previously created. I’ll post a copy of the PDF once I have that completed. In the meantime, I’ll continue to add the 5″ x 7″ versions of the Wall Art that I like whenever I can — and some of them have been great. In particular, I loved the Past, Present, and Future card that Topps recently issued, as well as last year’s Call-Ups Postcards of Maikel Franco, which used the ’59 design. I was considerably less impressed with their Schmidt ’80s Throwback Thursday Postcard. I suppose Topps deserve credit for trying to make the card look like it was an ’80s issue, but the design looks like a reject for one of the 44-card box sets endemic to the era and they have used that particular photo so much that it should now be considered part of the public domain. Finally, just because it gives me a way to tie this neatly end this post, Topps has also issued a 5″ x 7″ Series One team set. I assume they’ll do the same after releasing Series Two, but I won’t care if they decide not to. I just view them as oversized parallels and have no interest in them. Those of you who followed this blog for long enough know that I regularly alternate between somewhat frequent posting for a few months with disappearing for a few weeks or months. So, going nearly three weeks without posting is really not all that noteworthy. However, I must state for the record that recent changes WordPress made to its image upload tool certainly aided and abetted in my most recent stretch of silence. In particular, they removed the ability to easily add frames and spacing to images, and I relied heavily on those functions when posting images of my cards to this page. Although I can still do so (as evidenced by this post), it takes a lot of time-consuming, manual HTML. While not completely to blame for the recent lack of posting, it certainly provided a lot of disincentive when time was at a premium. I will adapt — I’d much rather WordPress got its damn act together and reincorporated border and spacing options for images — but only because I hate the thought of transferring everything to a new site. 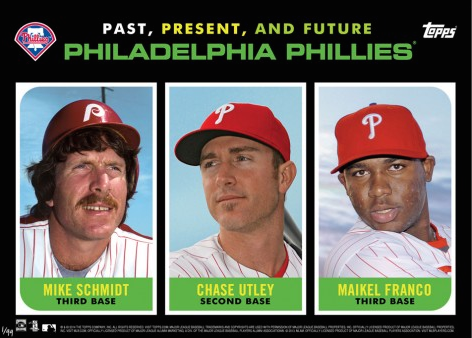 I was both pleased and disappointed with the 2014 Topps Phillies Team Set. Based on the cards that overlapped with the offerings in the first series of 2014 Topps, there doesn’t appear to be any unique photos in this year’s team set — although we should withhold final judgment until we see both the second series and 2014 Topps Update Series. 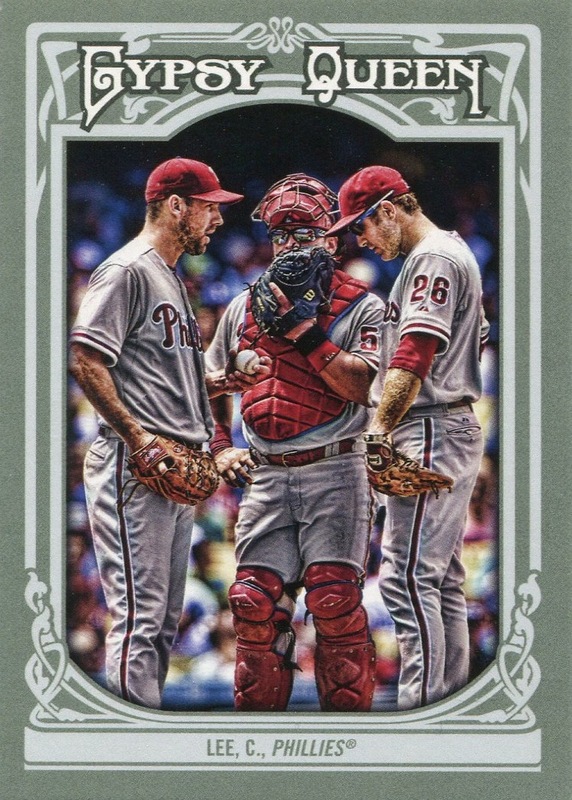 The lack of foil on the cards again confirms how unnecessary it is on the flagship product, so I like the look and feel of the Topps Phillies Team Set much better. Of particular interest, for now, are the Marlon Byrd and Freddy Galvis cards. Topps used an older picture of Byrd from his first stint with the team as opposed to digitally editing a newer photo — the opposite of what they did with Placido Polanco and Jim Thome in their second stints with the Phils. Aside from the completely natural look to the photo, the biggest giveaway is the number on his sleeve — Byrd wore “29” when he first played for the team. 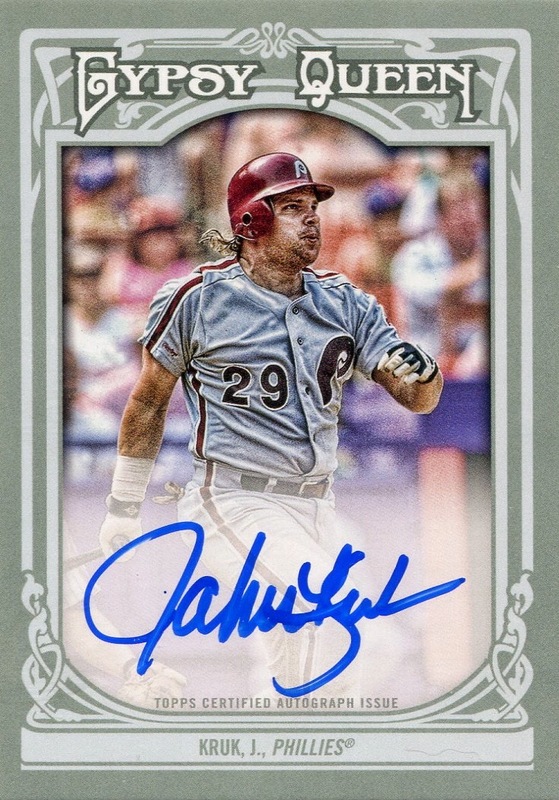 As for Galvis, this marks his first official Topps-issued MLB card (as opposed to his Bowman Prospects inserts, which we all know are not officially MLB cards, rookie or otherwise — wink, wink, nudge, nudge, say no more). Sadly, we don’t see his face, or The Rookie Card Logo. Without an explanation from Topps, I’m willing to bet that since the logo is jointly administered by MLB and the MLBPA, Panini gets credit for releasing Galvis’s official rookie cards back in 2012. Or, maybe, this is going to be a case where the is no “official” rookie card. 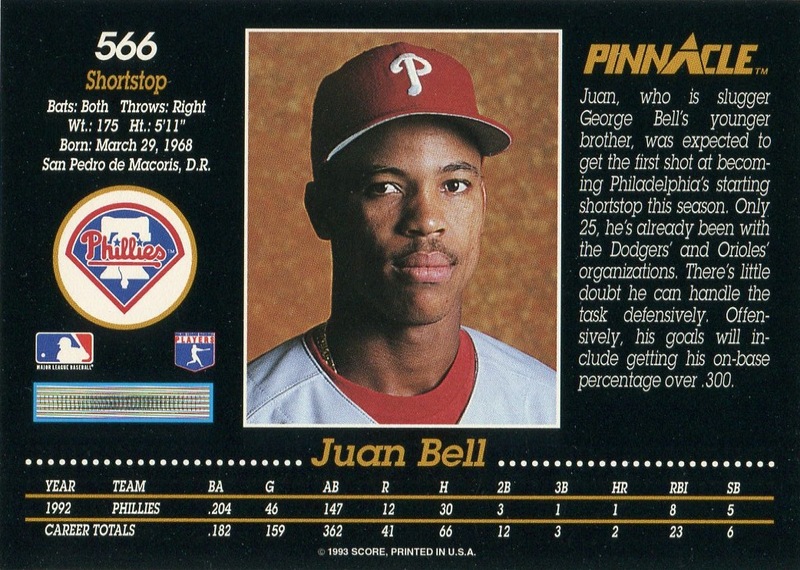 Finally, I will post an updated version of the Phillies Baseball Card Database sometime early next week. I want to properly incorporate all the information from Topps Heritage, Topps Gypsy Queen, Topps Museum Collection and (2013) Bowman Chrome Mini releases before posting it. However, I must admit that I’m glad to say that amongst the various updates is one delightful oddball set that recently came to my attention and that is now prominent in my wantlists: Enterplay’s 2009 MLB Fan Pak. More about that set in a future post. 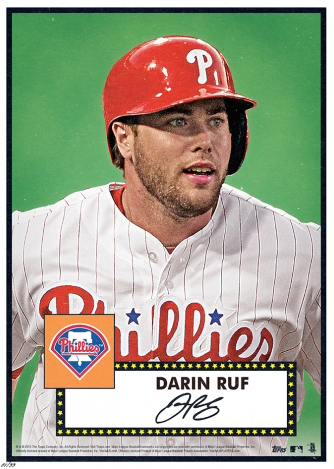 Over the course of 2013, the onslaught of Darin Ruf cards — especially the autographed variety — struck me as one of the more fascinating developments of the year. 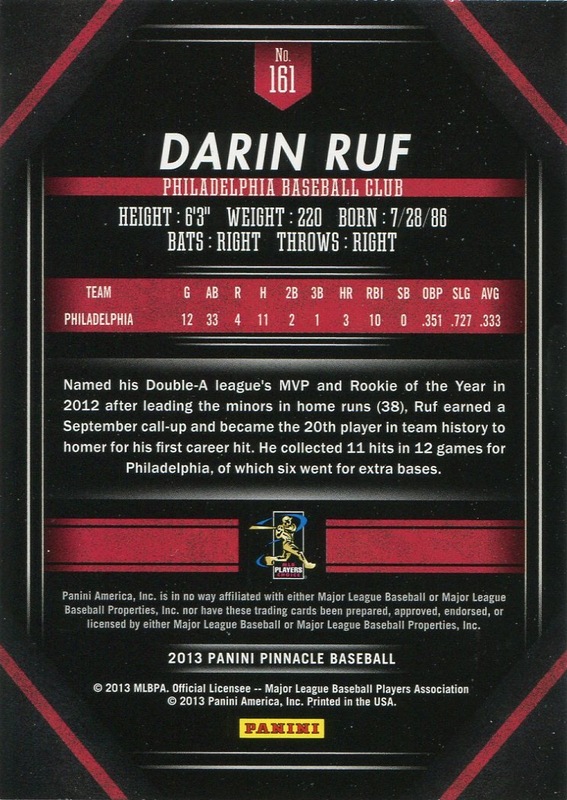 With the acquisition of his card from 2013 Panini America’s Pastime, which I assume is t he last set of 2013, I had added 23 Darin Ruf cards from various products released over the year. All of these cards were unique — meaning that parallels did not pad my total — and 11 of them were autograph cards. As a Phillies collector, it’s been a long time since I’ve seen this type of rookie/prospect boom. In fact, the last time I saw anything like this was when Michael Bourn was making lots of noise in the upper levels of the Phillies farm system — as hyped as Domonic Brown was among Phillies fans back in 2010, Topps really didn’t produce a glut of Domonic Brown cards in the same way it did for the likes of Bryce Harper, Stephen Strasburg, and Yasiel Puig over the past few years. 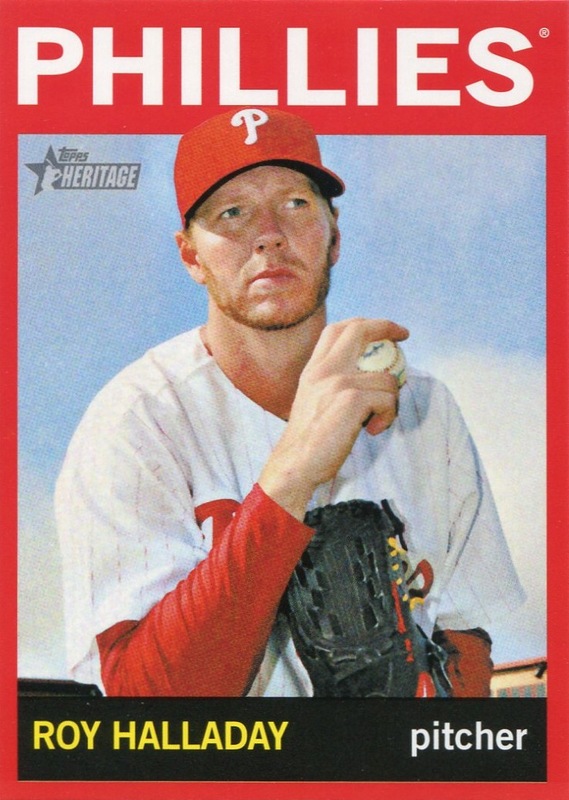 Mind you, the lack of a Phillies rookie/prospect baseball card boom is directly attributable to the fact that there are far fewer sets than there were approximately 10 years ago and, more importantly, to the lack of real prospects working their way through the farm system since they began their run of division titles in 2007. Sadly, it’s very likely going to be a rookie/prospect bust on Ruf. Nothing against him as a ballplayer — in fact, I think the Phillies organization has horribly undervalued him because at 27 he is too old to be considered a legitimate prospect. However, I just don’t see him having a great major league career, not even the type of late-bloomer career enjoyed by the likes of Raúl Ibañez. 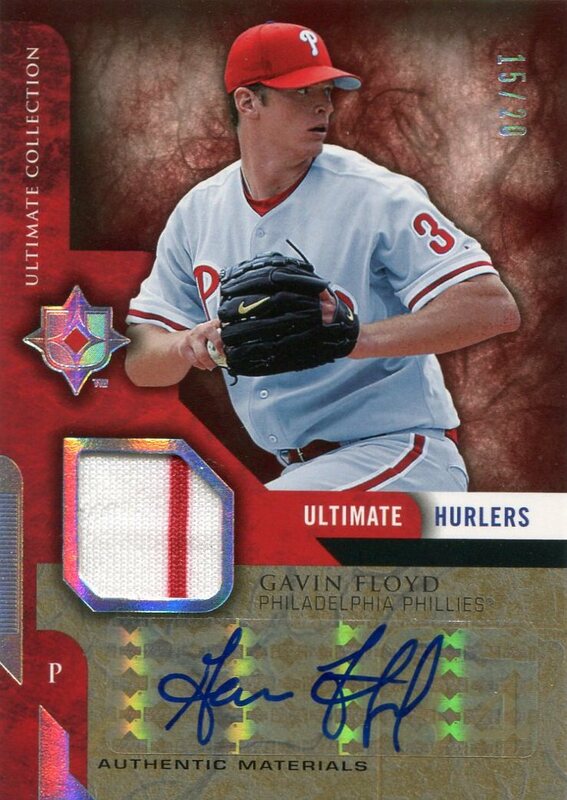 So, unlike Ryan Howard or Cole Hamels, each of whom saw a surge of autograph and memorabilia cards in the few-year period surrounding their Major League debuts, Darin Ruf is likely to join the likes of Gavin Floyd, Zack Segovia, and Johnny Estrada in the ranks of former Phillies rookies/prospects whom you can easily and cheaply acquire lots of autograph cards. I feel like I would be remiss if I didn’t mention one other name: Marlon Byrd. I don’t know if he necessarily belongs in the same class as Floyd and Estrada, but you can easily obtain plenty of Byrd’s memorabilia and autograph cards from his first stint with the team. My collection contains 19 cards bearing his autograph and 14 cards with a piece of memorabilia embedded upon it, and there are still plenty of such cards I can inexpensively and easily add without resorting to parallels to pad the numbers (forgive me for not running a report from the database to see just how many options there are, but I know the number is ridiculous). 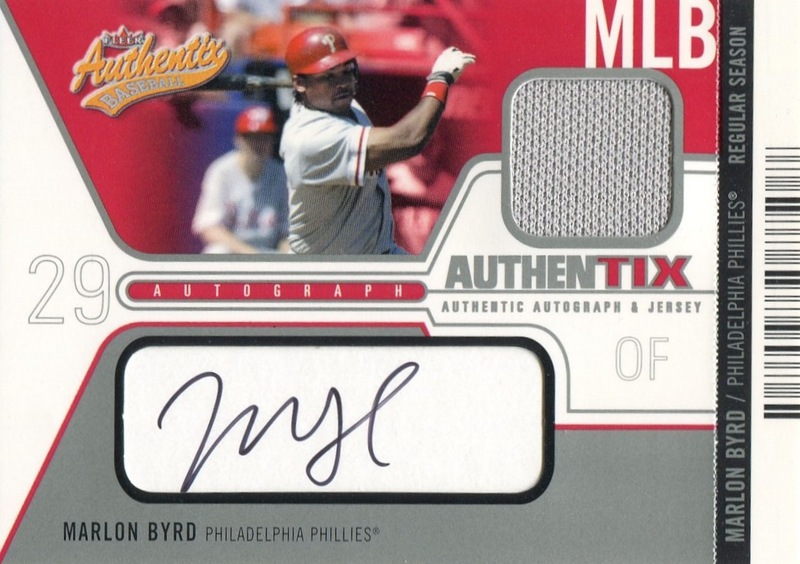 Given how much the hobby has changed since Byrd’s Major League debut, I’m fairly certain Phillies collectors will never again experience anything like the barrage of autograph and memorabilia cards that occurred early in his career. I must admit, however, that I am eager to see whether or not Topps or Panini will decide to issue new autograph and memorabilia cards for his second stint on the team. Featured cards listed at end of post. As I’ve stated before, I want to see Topps’s monopoly on MLB-sanctioned card broken (even if it won’t happen until 2020, at the absolute earliest), but I can’t bring myself to stop collecting their cards because of what it will do to my collection. 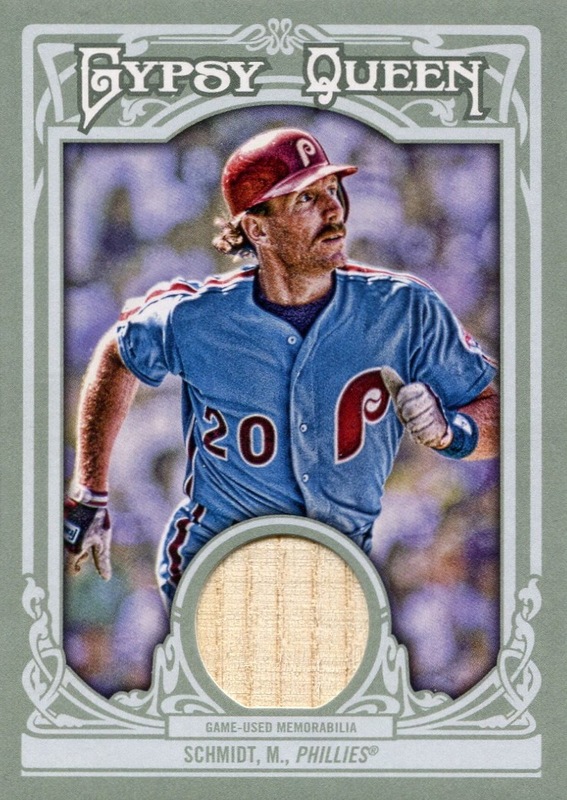 Thus, the only way to make my displeasure known is start spreading some of my collecting budget around to the sets that only bear MLBPA approval. Yes, I’m going to have to live without MLB logos and team names, but such cards have been around for over 40 years now. 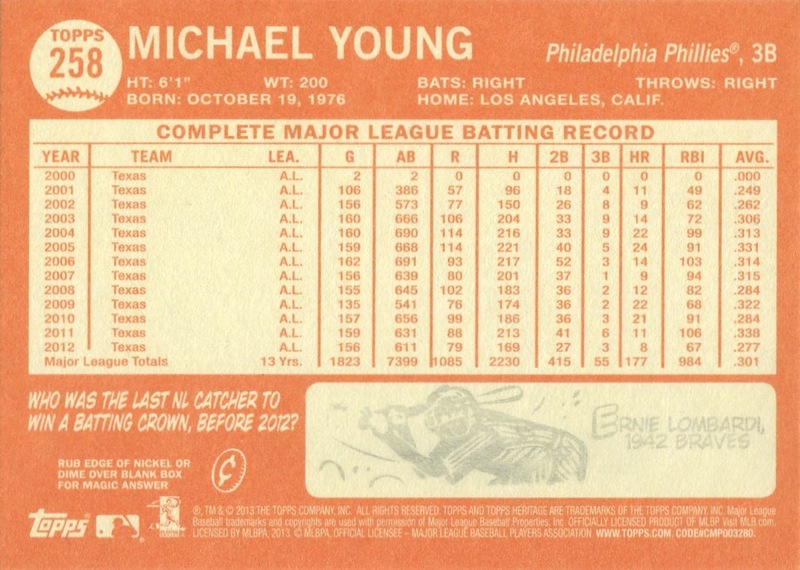 In fact, some of my personal favorite oddball Phillies releases were produced by Michael Schecter Associates, the longtime, indisputable king of such sets from the ’70s through the mid ’90s. However, the playing field has changed somehow since sets bearing the MSA copyright freely roamed the land. MLB is paying much closer attention than they used to. Back in the ’70s and early ’80s it wasn’t uncommon to still see the use of team monikers on such issues, even if it wasn’t completely legal. Furthermore, MLB’s legal team is making harder for the MLBPA-approved sets to bear photography that links the photograph to a facility in which MLB games are played. True, today’s digital photo manipulation technology makes it easier to perform all the tasks necessary to keep the MLB lawyers at bay, but it’s hard to escape the end result: regardless of quality, the photos in the cards just seem to lack a vibrancy found in even the blandest Topps issue. As a result, one needs to judge the MLBPA-sanctioned issues with a different set of criteria. With that in mind, there’s quite a lot to like about Panini’s revivial of the Pinnacle brand. It works as a decent low-end set, a kind of throwback set I alluded to a couple days ago: no foil or other printing gimmicks, a limited number of parallels and no SPs. Furthermore, Panini designed the fronts to reflect the designs of the original Pinnacle releases; most notably, the all black borders, and rookie cards grouped together in a subset. Even the parallels are resurrections of the original sets’ parallels: Artist’s Proofs and Museum Collection. Unfortunately, the backs look nothing like the backs of the 1992 & 1993 sets which fronts of the 2013 edition clearly evoke. Most notable is the absence of player portraits on the back, and it would’ve been nice to see Panini make such an effort on this release. Beyond that, it just looks like a different design aesthetic altogether, which is a shame given that the fronts of the 2013 set make it look like a natural predecessor to those earlier releases. 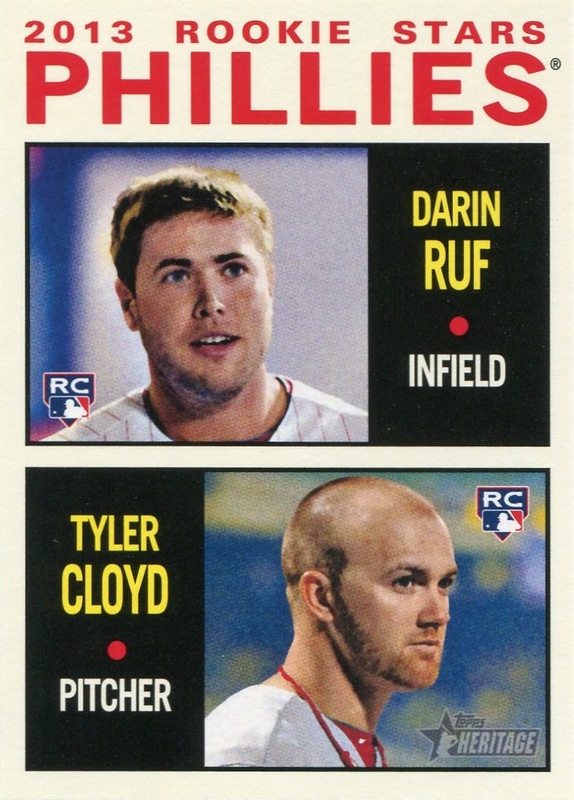 As for the Phillies player selection, the huge emphasis on rookies, which encompasses fully ¼ of the whole 200-card set, leads to Darrin Ruf and Tyler Cloyd pushing out a couple Phillies who probably should’ve been included instead — most notably, Cliff Lee. 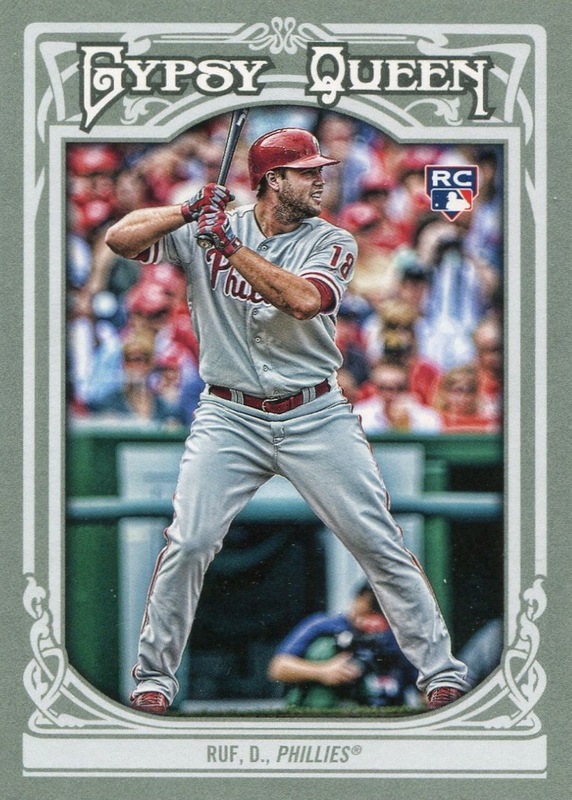 In addition, I’m not sold on the inclusion of Michael Young in the set, but clearly both Panini and Topps both felt that his presence in many sets this year was more important than the inclusion of Jimmy Rollins, whose status seems most impacted in sets hovering around this size. 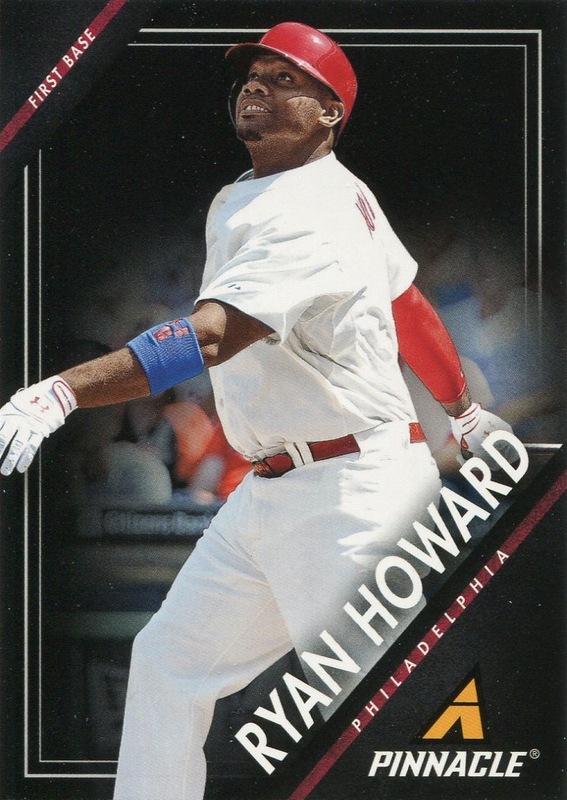 With just four other cards in the set, it’s hard to quibble with the remaining player choices: Chase Utley, Roy Halladay, Cole Hamels, and Ryan Howard. There are two really notable aspects to the set’s inserts. 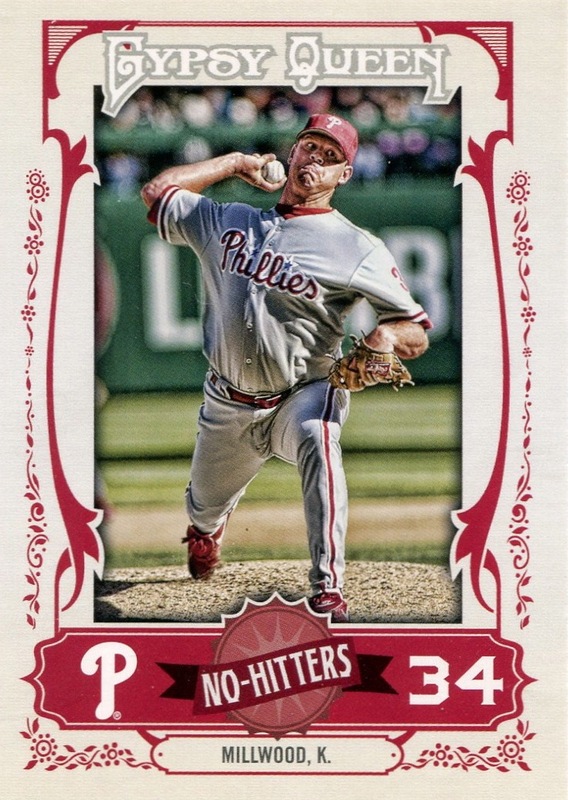 First, we get Tyler Cloyd’s first autograph card properly showing him in “Philadelphia” attire. 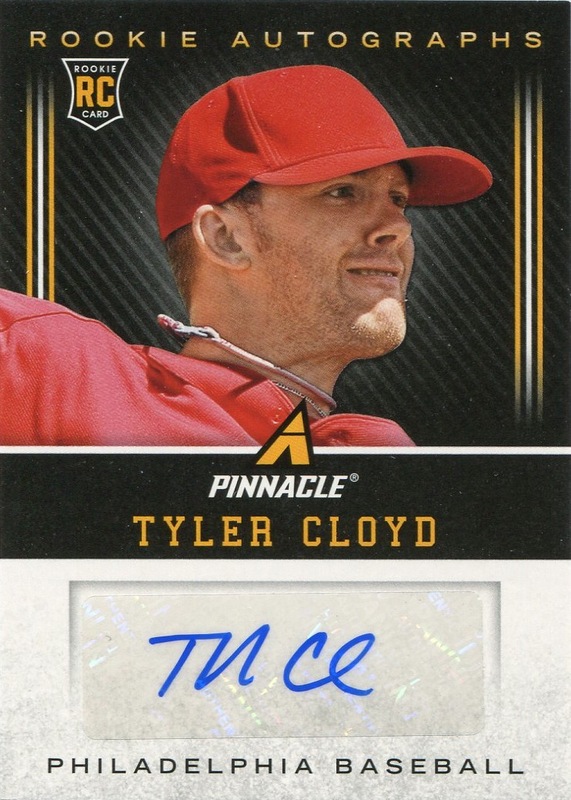 Topps still hasn’t issued a Cloyd autograph card — though to be fair, I think that is a borderline defensible position from Topps’s standpoint as Cloyd really is little more than a AAAA roster filler material. 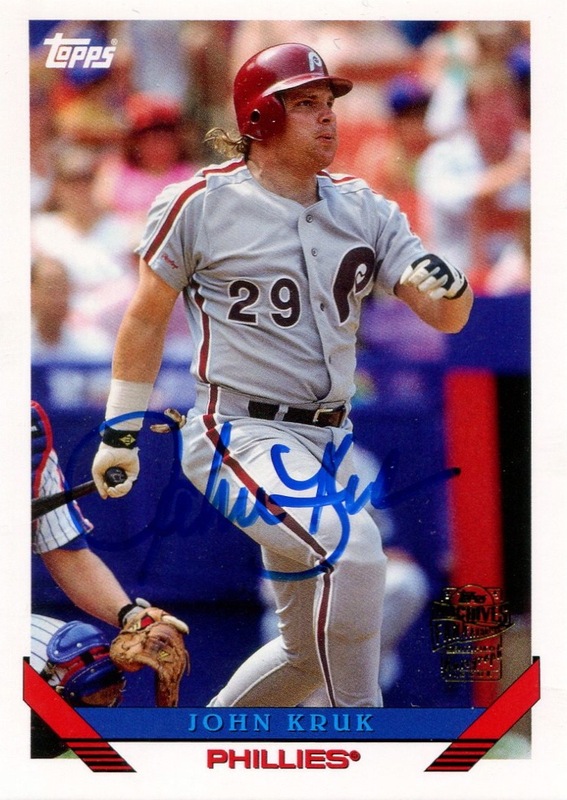 So, at this time this is the closest you are going to get to a true Cloyd Phillies autograph card. 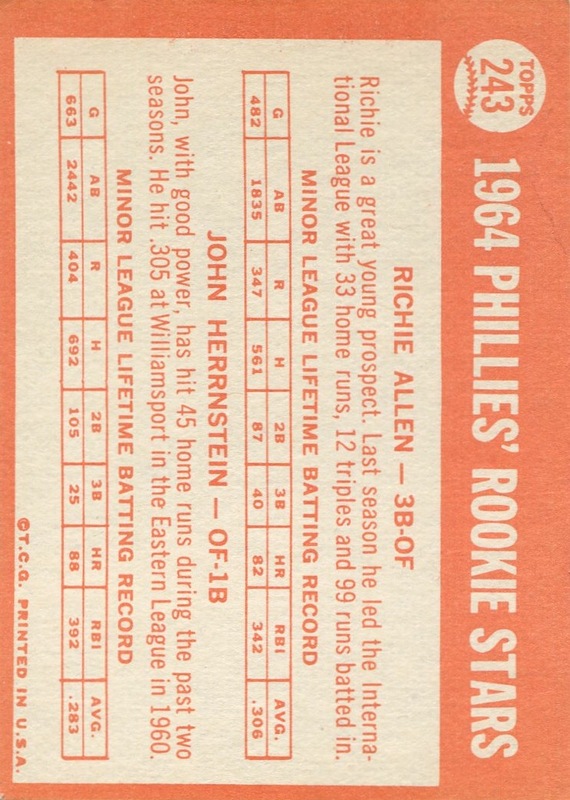 (His only previous autograph card, also a Panini release, shows him in either minor league or collegiate attire and looks even less like “real” Philadelphia card.) 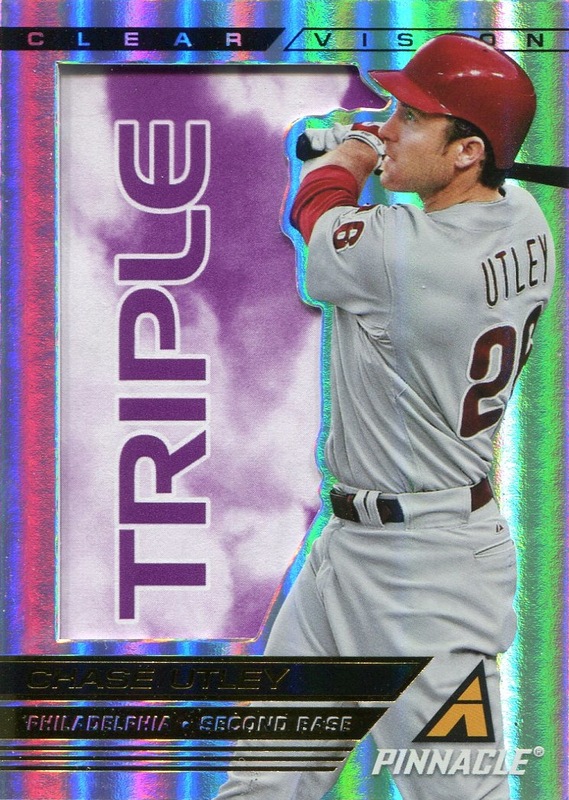 Second, Chase Utley gets a lot of insert attention in this set and is the only Phillie with multiple inserts, checking in with three. This is a refreshing change from what I’ve seen this year from Topps, who seems to have largely forgotten that even with all his injuries over the past few seasons, he’s still produced as one of the game’s elite second basemen. However, one of those insert sets, Clear Vision, is a real puzzler. There’s no explanatory text whatsoever on any of these cards whatsoever, so without seeing the marketing material, I cannot make any sense of why players were selected for this insert. Additionally, I am unable to discern neither the rationale behind the various parallels for this set; the parallels each bear a different word on them — in the case of the pitchers, they are “Complete Game,” “No Hitter,” “Win,” “Shutout, and “Perfect Game.” Furthermore, are the parallels printed equally or in varying numbers? Once again, we have an insert set that serves no purpose whatsoever (not even a thinly applied one), other than to provide an excuse to print more cards of star players. 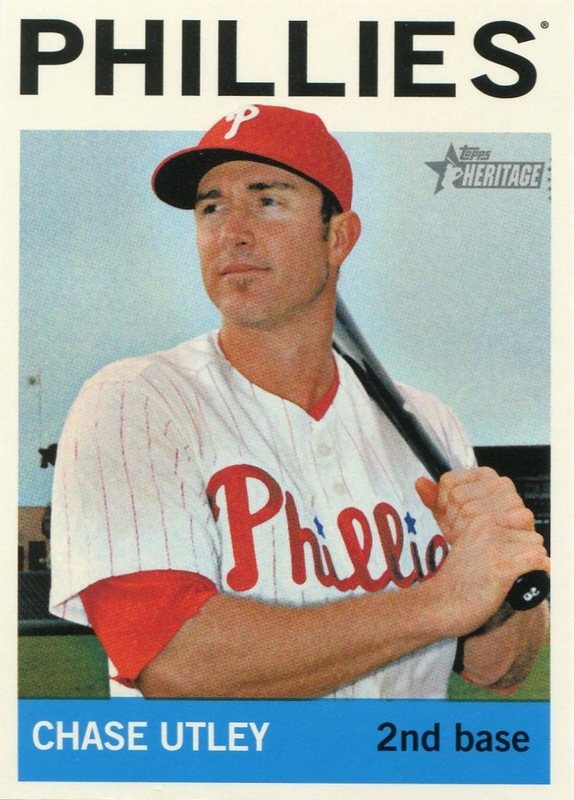 At least thus far Panini hasn’t reused the same photo of Utley in any of its sets — though, admittedly, that’s a little easier for them since they don’t product as much product as Topps. Given the restraints the lack of MLB approval placed upon Panini, 2013 Pinnacle is a fairly decent set. Although it will never become a set collector’s will look fondly upon, it works well in the low-end segment of the hobby that the manufacturers really neglect since it’s not a huge money maker. Furthermore it provides an interesting glimpse into what Panini or Upper Deck, when they finally come around to issuing their first new baseball cards in three years, might produce should either of them decides to issue a comprehensive set of baseball players who play at the highest professional level in America. I, for one, am hoping such a set comes out sooner than later. In an off-handed way, I started reviewing this set when I posted about Topps’s Photoshop mishaps with the Ben Revere and Delmon Young cards. Although those were the first to Phillies from the set I owned, I actually acquired them at the beginning of my efforts to build a complete set — a separate endeavor from my collating a nearly complete master team set covering all the SPs, inserts, & basic parallels. Given how much I loved the 2011 & 2012 Gypsy Queen sets, seeing those two cards dampened by enthusiasm as I waited for my eBay purchases to filter in. 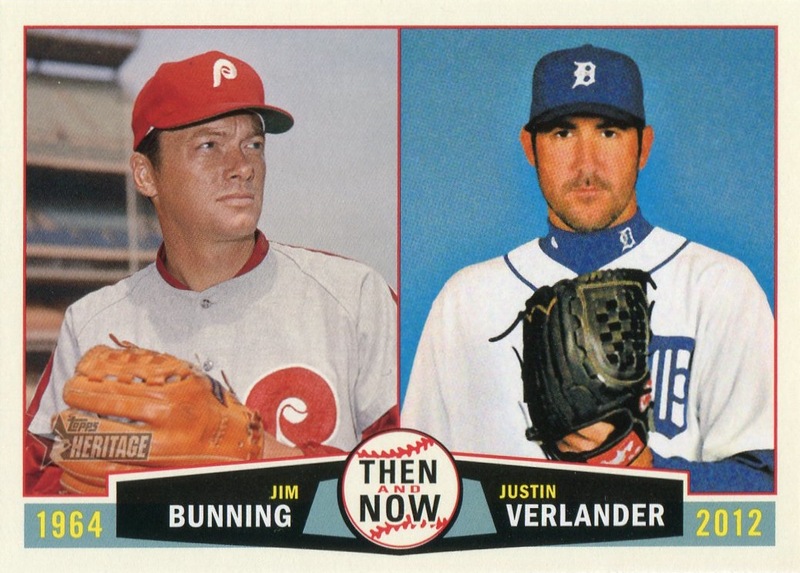 Now that I have them all — or, at least, enough of them to feel comfortable in writing a full-fledged review — I can honestly state that the Revere and Young cards were an unfortunate harbinger of what I saw as a Phillies collector. But, before I continue talking about the set, I feel the need to recap a couple things Topps did with their 2011 and 2012 sets. In particular, the way they previous handled photo variations and the mini parallels. While I understand the appeal of the minis to a certain segment of the hobby and they certainly make sense in the context of the Allen & Ginter’s and Gypsy Queen products, I overwhelmingly prefer my cards standard-sized. In 2011, I was a little disappointed to discover that the photo variations were only available in the mini parallels. 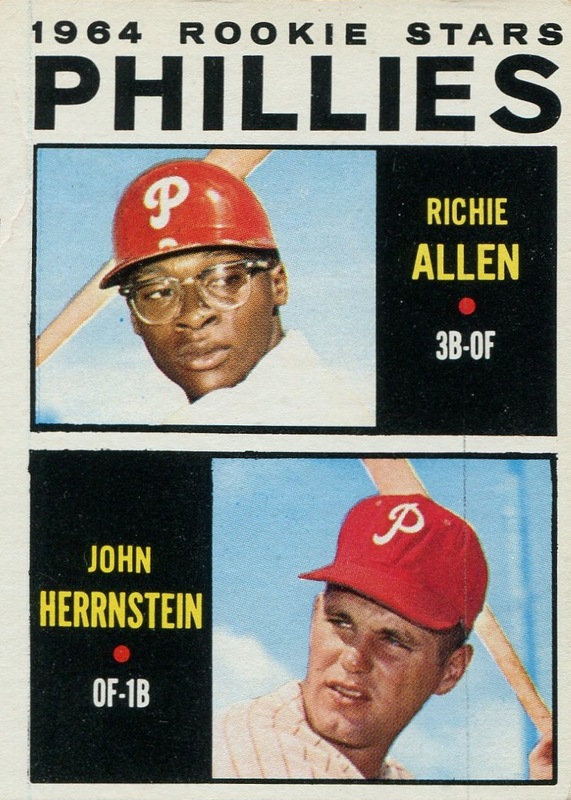 If it hadn’t been for those variations, I never would have bothered collecting a Phillies team set of them as well. However, in 2012, Topps decided to include photo variations in the primary set. Furthermore, these variations served as the SPs, thus making Gypsy Queen, from both the team collector and the set builder standpoints, a very attractive alternative to Allen & Ginter’s. True, the minis still had a couple exclusive variations, but the fact that most of them were available in standard-size as well made me far more forgiving to Topps for feeling compelled to assemble the mini team set as well. Despite my aversion to minis, I actually loved everything about the way Topps handled them, the SPs and the photo variations. For this year’s Gypsy Queen set, unfortunately, Topps decided to take a step back and primarily relegate the photo variations to the minis and reintroduce non-variant SPs to the primary set. Worse, the SPs are scattered throughout rather than clustered together in the high numbers, as they are in the Heritage set. Even worse still, the few photo variations that they did include in the primary set are incredibly rare/expensive super short prints. 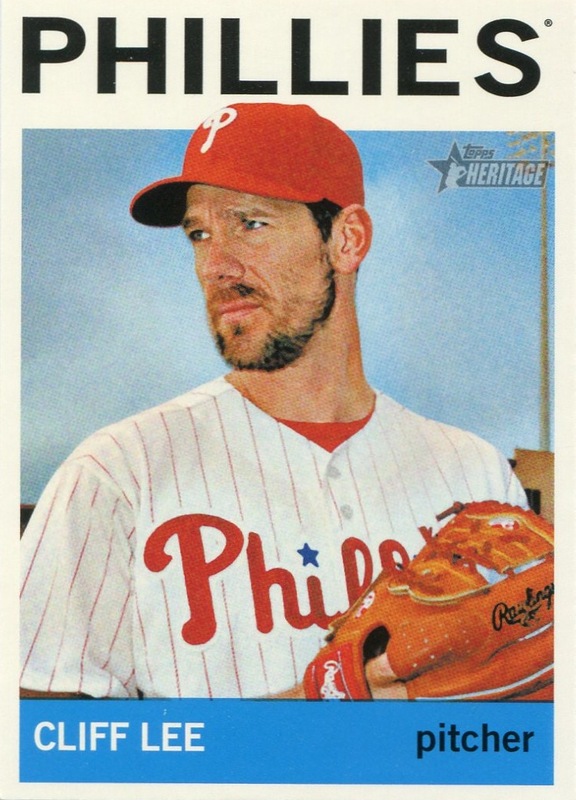 Given the small number of Cliff Lee variants that have appeared on eBay thus far, I feel fortunate in acquiring one and being able to afford it. Finally, just to rub a little metaphorical wax stain to the whole endeavor, this year’s set contains the smallest number of Phillie photo variations to date. Quite frankly, I was disgusted by the whole change in approach by Topps, whom I felt had done a marvelous job with last year’s Gypsy Queen offering. Then there was the glass-shatter moment. For those of you who don’t watch How I Met Your Mother, or don’t recall the specific episode of the show where the concept was introduced, the glass-shatter moment is when someone points out an irritating habit, heretofore unnoticed by you, exhibited by the person you love. Once it’s made obvious, you cannot help but be annoyed by this flaw every time you see it. 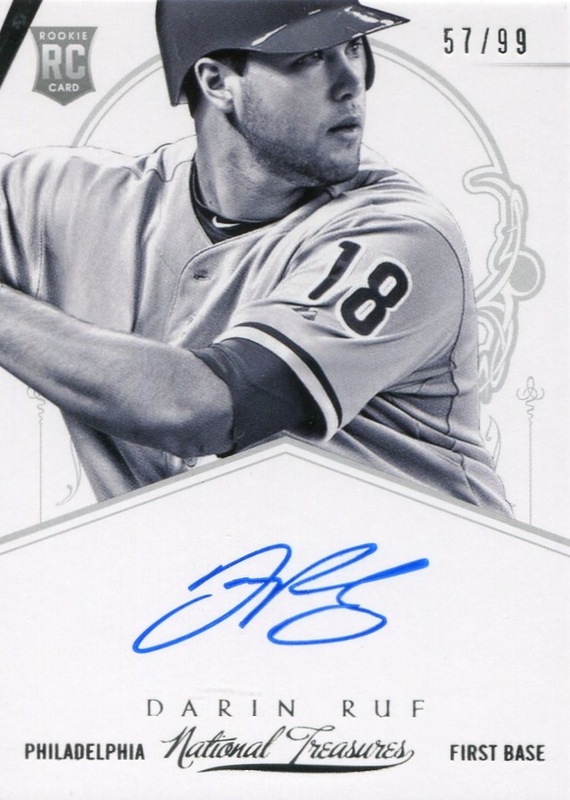 This occurred when I read the following from the recent “Beauty and the Beast” post over at Night Owl Cards: “I still think the 2011s look very nice. But since then, GQ has overdone the border motif, increased the size of the border frame…” He’s absolutely right. While I disagree with him on most of his other criticisms of the set, once he pointed out the increased border size on the cards I couldn’t help but continually notice the meager amount of space allocated to the photo. Furthermore, as much as I loved last year’s set, at the time it came out I actually stated, “when you compare the 2012 set to other cards issued during the 19th century it certainly seems as if the border is just a little too ornate.” That problem is only worse in the 2013 set. Please keep in mind that I wanted to love the 2013 set, and it actually pains me to acknowledge all of its drawbacks. I wish the pain would end there, but alas, that is not the case. I’ve grown to accept that in regards to retired players Topps doesn’t want to spend any more than necessary to acquire rights to photos it hasn’t used before, and that it will readily reuse a photo ad nauseum. But, is it too much to ask that they do a better job on rotating the photos they use on the autograph issues? 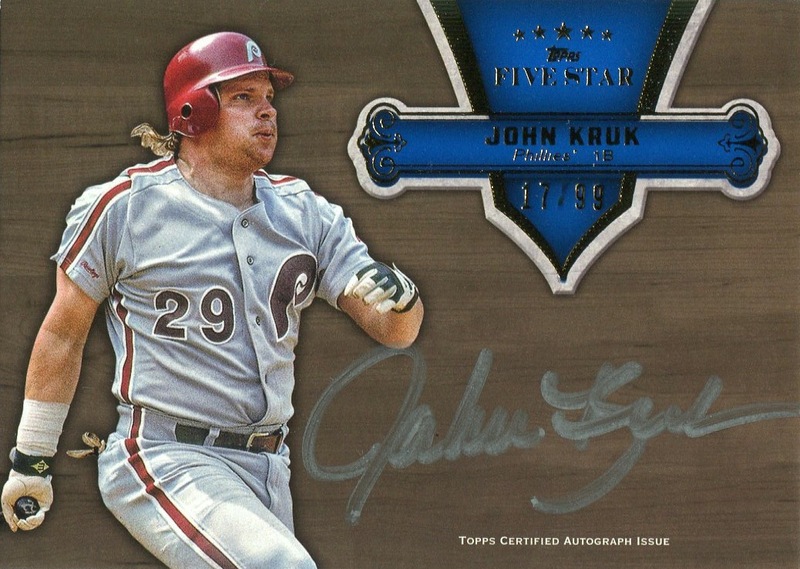 I have four John Kruk autograph cards from 2012 & 2013, and three of them use the same photo. Come on, Topps, you issued a few dozen different Kruk cards featuring different photos during the first half of the ’90s. You certainly could recycle a few of those photos again. Yet, while I am disappointed by many aspects of the set, there is still much to love. 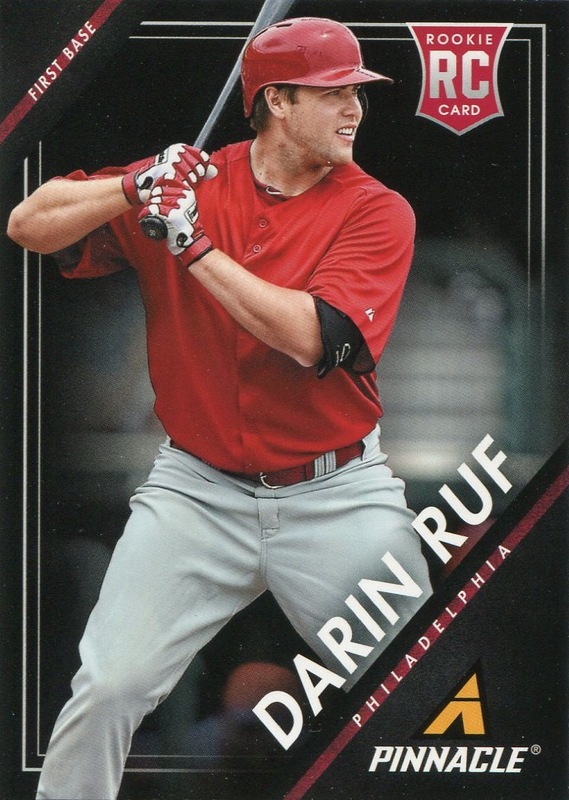 The number of Phillies relic and autograph cards, which includes Darin Ruf’s first fully-licensed autograph, is manageable in both number and quantity, thus making it relatively painless to acquire them — with the notable exception of Mike Schmidt’s jersey and bat relic cards. Furthermore, Topps continued its tradition of using the primary set’s design for those cards, thus making them a rather attractive extension of the set itself, as well as using different photos for those cards (that is, different from the photo used in the primary set) — I really do wish Topps would do more of this with their other issues. In addition, while I certainly think the border takes up too much space, I like the intent of the design and find it nicely reminiscent of the 1909 Ramly (T204) issue. I don’t think the similarities in border colors are coincidental. Finally, Topps once again did a great job with the insert sets — in particlar, the Dealing Aces and No-Hitters sets — while ensuring that although the borders are different, there is no question what set they were packaged with (this would be true without the Gypsy Queen name sprawled across the front of the card). So, while I am not as happy with this year’s set as I was its two previous predecessors, I actually am hoping to see Gypsy Queen return next year. Although I sincerely doubt it will happen, nothing would please me more than to see Topps make an effort to produce a set similar to what I described a couple years ago: a variant of the original Gypsy Queen border in conjunction with sepia-tinged photos of players posed in early 20th century style uniforms. Yes, I understand that many of today’s teams don’t have a history that goes back that far, but many of those same teams have find away that issue with throwback uniform days. Topps could certainly figure something out as well.